Dupuytren contracture is a thickening of tissue in the palm of the hand. It causes one or more fingers to be curled in toward the palm. The contracture can make it difficult or impossible to straighten these fingers. The exact cause is not known. Some may inherit the trait from a parent. Dupuytren contracture can happen on either one or both hands. The first sign is a nodule (bump) in the palm near the bottom of a finger. It may be sensitive to touch. However, this condition is often not painful. The bump then becomes a thickened cord. As the cord thickens, it shortens and pulls on the fingers. This curls the affected finger toward the palm. At first, the curling of the fingers are mild. It may worsen over time. How fast it worsens can differ from person to person. The ring finger is usually affected first. The pinky finger is often second. The index, and long finger may follow. Movement in the fingers will become more difficult over time. You will be asked about your symptoms and medical history. A hand exam will be done. The doctor will often be done based on exam. Treatment is more effective when the contracture is found early. All surgeries have some risk of bleeding and infection. 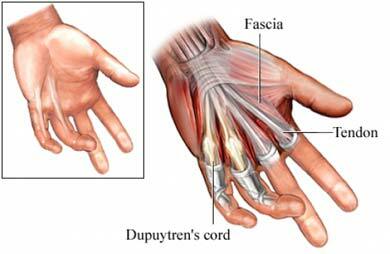 Dupuytren contracture can also come back after surgery. Exercise therapy may be needed. It can help to restore full range of motion after a repair. There is nothing that has been shown to prevent Dupuytren contracture. Badalamente MA, Hurst LC, Benhaim P, Cohen BM. Efficacy and safety of collagenase Clostridium Histolyticum in the treatment of proximal interphalangeal joints in Dupuytren contracture: Combined analysis of 4 phase 3 clinical trials. J Hand Surg. 2015;5:975-983. Degreef I, Tejpar S, Sciot R, De Smet L. High-dosage Tamoxifen as neo adjuvant treatment in minimally invasive surgery for Dupuytren Disease in patients with strong pre disposition toward fibrosis. J Bone Joint Surg Am. 2014;96(8):655-662. Dupuytren disease. EBSCO DynaMed Plus website. Available at: https://www.dynamed.com/topics/dmp~AN~T114104/Dupuytren-disease . Updated February 8, 2017. Accessed September 7, 2017. Lanting R, Broekstra DC, Werker PMN, van den Heuvel ER. A systematic review and meta-analysis on the prevalence of Dupuytren Disease in the general population of Western countries. Plast Reconstr Surg. 2014;133(3):593-603. Rahr L, et al. Percutaneous needle fasciotomy for primary Dupuytren's contracture. J Hand Surg Eur Vol. 2011;36(7):548-552. Riester S, vanWijnen A, Rizzo M, Kakar S. Pathogenesis and treatment of Dupuytren disease. J Bone Joint Surg Reviews. 2014;2(4):e2. van Rijssen AL, et al. Five-year results of a randomized clinical trial on treatment in Dupuytren's disease: percutaneous needle fasciotomy versus limited fasciectomy. Plast Reconstr Surg. 2012 Feb;129(2):469-77. 2/12/2010 DynaMed Plus Systematic Literature Surveillance https://www.dynamed.com/topics/dmp~AN~T114104/Dupuytren-disease : FDA approves Xiaflex for debilitating hand condition. US Food and Drug Administration website. Available at: http://www.fda.gov/NewsEvents/Newsroom/PressAnnouncements/ucm199736.htm. Published February 2, 2010. Accessed September 23, 2014.